The Brooks PureFlow was my favorite running shoe in 2011. 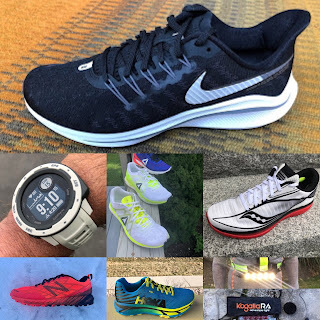 I have run over 300 miles in my first pair and find the combination of just right cushion, aligned gait cycle, strike point further forward without effort or mechanical gimmicks, wide toe box, light weight, and durability a pleasure to run in. I now have a pair of the PureGrit trail runner and am finding them equally fine,with the added advantage they can be comfortably used on road and trail. I stopped by the Brooks booth to find out more about what makes the PureFlow so special. My notes from a conversation with a product person from Brooks. The Ideal Heel moves the point of contact further forward. I can really feel that. Ideal Heel maintain the foot landing in a forward position, instead of causing a"heel brake" effect. Ideal Heel prevents over striding and helps alignment of the foot ( I agree!). This leads to potential fewer injuries-not sure on this claim but I have never been sore since I started running in PureFlow. 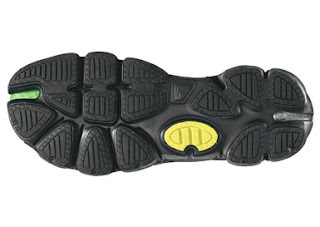 I wanted to know what the purpose of the "caterpillar" crash pods on the outer edge of the midsole were. I was told they smooth foot laydown in transitions. Larger the pods=more cushion. I asked about the yellow outsole pod (see picture above). I was told it was a neutral stability element. For me this pod is a key element of why the PureFlow is a great shoe. Given the more forward landing point my sense is my first point of contact to the road is right on this pod. The added stability there helps align the rest of the foot lay down. Why does the road feel seem to combine decent cushion yet is also highly responsive? I was told that blending the DNA material, (usually the forefoot and heel strike pads inserted into a conventional midsole) with the BioGoMo midsole all into one material provides a combination of responsiveness (DNA stiffens based on relative impact forces) and durable cushion throughout the entire midsole. 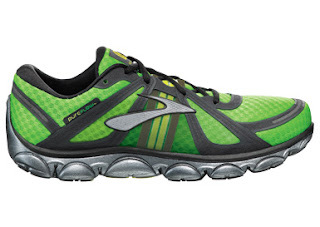 All the Brooks PureProject shoes include this combination of DNA and BioMoGo blended in different combinations. I feel this combination also contributes to the overall durability of the shoe. 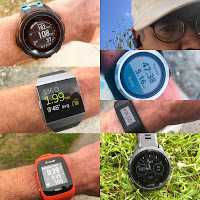 With 300 plus miles in most other shoes I would be feeling aches and pains, yet with the PureFlow as the material packs out I am still running strong in my first pair. I also believe my stride has adapted to a mid foot landing. So, the shoe has become more minimal and I think my stride has become more natural adapting to less cushion along the way. PureFlow 2: No changes to outer or midsole. Upper will be modernized and potentially lightened a bit.